What makes the Birmingham Balti unique? The "Birmingham Balti" could soon have its name protected by an EU scheme, if a private bid is successful. But what sets the popular "British fusion" dish apart from other curries? "You won't get the 'Delhi belly' with the Balti food," said Mo Ahmed, owner of the Al Frash Balti restaurant in Birmingham's Balti Triangle. The Birmingham Balti Association (BBA) has made an official application to the EU Protected Food Names scheme so the local favourite is given Traditional Speciality Guaranteed Status. If successful, the Birmingham Balti will join the protected ranks of "traditionally farmed Gloucestershire Old Spots Pork" and "Traditional Farmfresh Turkey". Where did "Balti" come from? The Birmingham Balti originated in the city during the late 70s, when curry chefs started to make their dishes lighter, healthier and served faster to suit Western tastes, the BBA said. A true Birmingham Balti must be served in the same thin steel bowl it is cooked in over a hot flame, as it is this "Balti" bowl that gives the dish its name, according to the BBA. "People like (it)... sizzling and hot and with the naan bread," said Mohammed Arif, owner of Adil Balti and Tandoori Restaurant, in the Balti Triangle in Birmingham. Mr Arif claims to be first man to introduce the Balti to Britain - after bringing the idea from Kashmir - when he opened his restaurant in 1977. He said that before he "recommended the Balti in the UK" in the late 70s, "there was different curry" in Britain, "not like this fresh cooking one". Before the Balti method of cooking was introduced, chefs would put curry in a "big pot in the morning and then serve them on a plate" after heating them up "in a microwave", he told the BBC. As well as keeping curry sizzling, the metal Balti dish retains all the dish's flavours. The curry should then be scooped up and eaten with a naan bread instead of using cutlery, in a traditional fashion. "Pieces of naan are traditionally torn off by hand and used to scoop up the hot sauce from the pot and wipe the bowl clean at the end," according to the BBA. The high heat method of cooking Balti is thought to have stemmed from Western customers' expectations to be served their meal quickly. Traditional curry flavours like tikka masala, tandoori, rogan josh, korma can all be cooked in a Balti style. Mo Ahmed, owner of Al Frash Balti house, agreed that the Balti style of cooking was not only quicker, but also a lighter and healthier version of a traditional curry. "It's very much like stir-fried cooking," he said. "It's a lighter alternative for what people have been used to, which is a heavy, rich sauce, quite oily, (which) sits quite heavily on the stomach." Chicken tikka masala: In 2001 former foreign secretary Robin Cook proclaimed chicken tikka masala to be "a true British national dish"
This is because the Balti pioneers of the 70s and 80s switched from using traditional ghee, which is high in saturated fat, to using vegetable oil. While ghee is the traditional cooking ingredient used on the south Asian sub-continent, the use of vegetable oil in Birmingham Baltis is stipulated as a key unique feature in the BBA's application to EU. It requires that all Birmingham Baltis must use vegetable oil instead of ghee. Another requirement is for all meat to be "off-the-bone" to allow it to be cooked quickly over the hot flame. This off-the-bone preparation of meat sets the Balti apart from the more traditional "on-the-bone" meat used in the "one-pot" style of cooking from the Indian subcontinent. While "one-pot" curries might take hours to cook all the ingredients, Balti chefs add meat and vegetables to the dish one ingredient at a time. And freshness of ingredients is crucial to real Balti connoisseurs. "Pre-prepared generic commercial curry pastes and powders are not used and not permitted" in any true Birmingham Balti, according to the BBA. Baltis can vary from restaurant to restaurant as each Balti house prepares its own "restaurant sauce" to use as a base. Mr Ahmed said the sauce used in his Al Frash Balti house was "partly trade secret", but revealed that it was made with a base sauce of garlic and onions and a mixture of spices. "You got turmeric, you got garam masala - which is a mix of masala," he said. If the Birmingham Balti is successful in gaining EU Traditional Guaranteed Status, restaurants with Birmingham Balti on the menu will be annually inspected to ensure they meet the correct curry criteria. 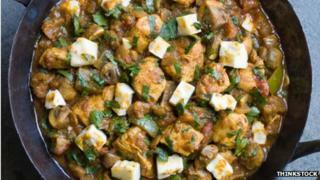 But with Balti being served up as a popular dish across the UK, the BBA said it was concerned that variations of the dish could lose the quality of the Birmingham original. The Balti differs in its fresher "cleaner" taste when compared to many "Western-style curries", which are sometimes served "using a highly coloured, thick cloying sauce which can overpower any of the individual flavours", it said in its application. Mr Ahmed agreed that the true Birmingham Balti cooking style should be protected. "You know there's a lot of restaurants out there that will say they create Baltis. What they're actually creating is curries."